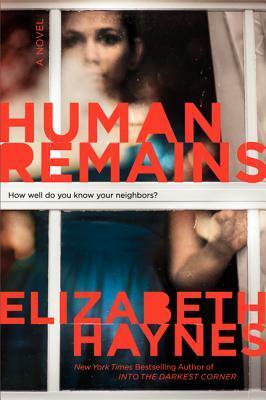 The cover of Human Remains by Elizabeth Haynes holds the intriguing teaser: How well do you know your neighbours? But the crux of the book is really in the question: How well do your neighbours know you? More to the point, if you were to die when alone at home, how long would it take before someone found your body? How long would it take before anyone even noticed you were missing? Haynes’ first book Into the Darkest Corner is still one of my favourite books of all time. I read it years ago and can still remember the intense claustrophobia, disgust and fear I felt as I read it. Her second book didn’t quite grab me as much as the first, but I was still intrigued by her characters. Her third, Human Remains, did not affect me as viscerally as Darkest Corner did, yet I believe it just may be her most powerful yet. Haynes’ brilliance is in her uncanny insight into the human psyche, whether it’s a woman struggling to move on from an abusive relationship or a woman trying to escape her past, as in her first two books. In Human Remains, Haynes plays on our fears of loneliness, an almost ironic condition in today’s hyper connected world, yet it’s this very hyper connectivity that sets into sharp relief how alone some of us really are. The protagonist in this book, Annabel, is a police analyst who notices a trend of deaths in her hometown where the victims’ bodies weren’t discovered for several days. There is nothing to tie the deaths together — all appear to be from natural causes — and Annabel’s colleagues don’t deem it worth an investigation. But Annabel is intrigued by how all these victims had been dead for some time before anyone even noticed their absence, and while she had never really considered herself lonely, the pattern forces her to take a look at her own life and wonder who would notice if she were gone. It’s a disquieting notion, and one that will haunt the reader as well. Haynes tells the story from multiple points of view — Annabel’s, of course, and also a creepy man named Colin. We also get chapters from some of the victims, and rather than a violent description of an attack that leads to their deaths, these chapters feel almost elegaic. There is no hint about what or who caused the deaths, but there is a glimpse at the person who lived before that moment. In a story where you know these characters will be forgotten, there is both comfort and a touch of despair in these all too brief tributes to their memory. The drive to keep turning the page isn’t so much to find out how the people are dying. There is a great sense of mystery, with almost a locked room feel because the answer is hard to figure out. The answer, once revealed, is chilling, and not because of its inhumanity, but because it is all too human. The villain is probably even more reprehensible than the one in Into the Darkest Corner, because this one preys on the very weakest in society — and on weaknesses that likely everyone can relate to. Human Remains isn’t the page turner Into the Darkest Corner is, nor will it be counted among my absolute favourite books ever as Darkest Corner is, but the issues Human Remains raises will stay with you long after you finish reading. Haynes taps right into our darkest fears, and lays bare our deepest vulnerabilities — that we are, in the end, truly alone, and that no one will care when we’re gone. We support Annabel’s fight for these victims, and we rage against the murderer’s predation, because ultimately, the idea behind this story hits far too close to home. This entry was posted in Book Reviews and tagged 50BookPledge2014, Fiction, Harper Collins, Mystery, Thriller by Jaclyn. Bookmark the permalink.